Men and women spend money differently. A study by the FINRA Investor Education Foundation in April 2012 shows that women who aren’t financially literate are more likely to engage in exorbitant credit card habits than men with the same level of financial literacy. Both sexes are guilty of making mistakes with money however; I wanted to highlight some of the mistakes women make specifically. This way, we can better understand where we make our mistakes and how we can approach the way we spend our money differently so we don’t make those same mistakes. Times are tough ladies, and we want to make sure we spend and save smart. Do you ever spot a pair of expensive shoes or jeans and charge it without consulting your budget? GenXFinance experts report that many women charge items that they normally wouldn’t purchase with cash on credit cards and tend to “forget” about the purchase. Credit card purchases are just as real as cash purchases and if you’re using a department store credit card with a hefty APR, you’ll end up paying more for your fabulous find in the long run if you don’t pay off your balance monthly. Sure, we all like to splurge once in awhile, so instead of giving in to impulse purchases, think it through and plan. Do you have any extra income coming in? Are there any special occasions coming up where you could receive it as a gift? If you’re still convinced that this item is a must-have, pay off the balance at the end of the month. Paying off your credit card every month will ensure that you don’t incur any fees or interest and will improve or keep your credit score healthy. So you’re having a work day from hell or you’re trying to mend a broken heart so you participate in some retail therapy to lift your spirits. This is a BAD situation! How many of the items you buy while you make yourself feel better will you actually use and need? 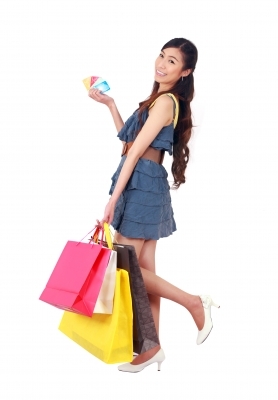 According to Eversave.com, 67% of women felt guilty about a purchase. Most likely, the purchases you make will only make you feel better temporarily and you’ll end up feeling guilty about spending the money afterward. Not to mention, you’re still going to feel upset about whatever was bothering you in the first place. What to do when you need to blow off some steam? Try doing something that you’ll feel good about doing like hanging out with friends and venting, working out or get lost in a good book or movie. You won’t ever feel guilty about doing any of those things, plus you’ll get your mind off of the problem for awhile so you can think it through clearly later. Are you in a relationship and leave all the financial responsibility to your partner? It’s very important to build your own credit and not depend on anyone to handle your finances. Money expert Suze Orman warns that blindly leaving your finances to your significant other is dangerous! Orman states that you should submerge yourself into your finances so that in the case that your love wasn’t as good at finances as you thought, you’ll be aware of the situation and be able to quickly take steps to make changes. Also, if all credit is built through their name, it’s not doing much to build your own credit which takes time. Or in the opposite situation, their credit could be clean while yours is getting damaged. Avoid any nasty surprises by taking a leading role in managing money. As much as you trust and love your significant other, you never know what they believe is solid financial planning and you don’t want to end up with a massive debt or find out your precious savings were spent on a video game collection. It’s good to keep the lines of communication open between couples and money shouldn’t be something kept a secret. Get to know how your partner spends and what their financial history is like. Are you the type of person who willingly helps out friends in times of financial crises? Have you ever co-signed for something as a favor or let someone else use your credit card for a non-emergency? LearnVest says being a good friend is well, good, but it doesn’t mean you have to become a lender to your friends and family. Constantly bailing people out can cost you a lot in the long run. A 2011 study by MSNBC found that women feel guilty more frequently than men meaning they were more disposed to helping people out financially or emotionally. Emergencies happen, so be smart about the way you help out. Think about the situation your loved one is in and determine whether a loan is really going to help them. Sometimes offering help in other ways besides monetarily is much more helpful than you might realize. If someone asks you for money because they’re out of a job, think of how you can help them job hunt or be a reference for them. Helping someone out doesn’t always mean you have to spend! GenXFinance says that those who fail to budget most frequently end up in debt or living paycheck to paycheck. If you want to start saving or planning for your future, it’s essential that you formulate a budget so that you can keep track of spending. No smart saver spends $10 on take-out coffee every day and gives in to impulse purchases! Budgeting isn’t just for women who have families or are in debt. Budgeting your money means you know exactly how much money you have and how much you have to spare after paying all of your bills. Who wants to guess how much money they have in the bank and hope they have enough money to buy gas or to buy that textbook you need last minute? LearnVest is a great website dedicated to empowering women to take control of their finances and it’s a great way to learn about saving, spending and budgeting. You can sign up for free emails, tips, and make a budget at LearnVest.com. Ladies, take control of your finances! Don’t make the mistakes that others have made but learn from them instead. Being financially independent is totally possible and a must in today’s economy. Educate yourself on how you can spend wisely and maximize savings. Be financially savvy so that you can plan for a bright future! I think this 5 mistakes always women do when they get money. This is must be have the first control, because there are some important thing to do. such as for the children and the financial future. I think being from the finance field it is surely a myth that men and women have different spending habits. As far as housewives are concerned they tend to be more demanding than the working women since they have nothing exciting to do. Shopping and spending money is one of the fun things that they can do. I have come across few women who work from home, in such cases also the men are not demanding. But if wive is sitting at home after finishing her household work, she has to keep her busy or do something exciting! SO honestly I don’t agree with this comparison of spending more! Also on a lighter note, a man can buy few things to wear, I thing the costliest thing would be a watch or a gadget, where has women has so much to experiment in every thing they do!